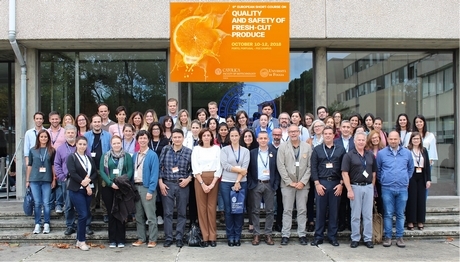 The 9th edition of the European short-course on the “Quality and Safety of Fresh-cut Produce” was held in Porto (Portugal) 10-12 October, thanks to the collaboration between the Universidade Catolica Portuguesa (UCP) and the Università di Foggia (Italy). As with the other editions (in Italy, Spain, Germany, UK, and Turkey) the objective of the event was to bring together some of world's major experts of the field in order to give to European industry representatives a thorough overview of the scientific progress so far available. “This edition was strongly participated with experts from all over the world” said prof. Manuela Pintado from UCP, one of the organizers of the Course “and that gave the Portuguese industry an important chance to meet with other experiences and to share innovative ideas”. Instructors from six different countries shared their knowledge and their experimental results with the professionals, students, researchers participating in the event; the main topics covered included technology and unit operations, packaging design and choice of plastic films, spoilage and human pathogens associated to fresh produce, detailed safety procedures and sanitization of washing water, pre-harvest effects on post-harvest quality, equipment for fresh-cut fruits and salads, handling considerations for a range of different fresh cut produce. In addition very innovative and topical issues were discussed in relation to vertical farming, shelf-life prediction, use of biomaterials, recover and re-use of wastes, reduction of process water, non-destructive approach to quality evaluation. Lectures were alternated with discussion sessions and the interaction among participants was very high. “It’s been a very lively edition with participants challenging instructors with interesting questions”, said Prof. Giancarlo Colelli from the University of Foggia, co-coordinator of all editions of the Short Course, so that discussion sessions resulted very stimulating and rich of valuable information”. Represented Countries were Portugal, Italy, United States, United Kingdom, Germany, Greece, Israel, and Spain. The course was also supported by 9 national and international sponsors which, as in other editions, contributed to the sustainability of the event allowing it to maintain low participation costs which made participation possible for small enterprises and students.